FLAT RATE SHIPPING on all of your orders within the USA! $5.00 gets your order to you via USPS Priority. We hustle for same day shipping if we receive your order by noon west coast time. Double wowza! Here comes the bride and all those wonderful bridesmaids. Don't forget the cute flower girl, mother-of-the-bride and mother-of-the-groom. These days it is so much fun seeing what brides choose to wear and gift. 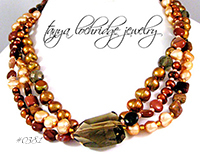 I have had the good fortune of designing custom pieces for several brides over the years. 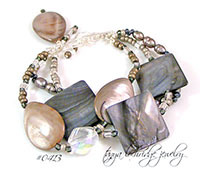 I get excited when the bride wants something out of the ordinary like kyanite and pearls, orange Botswana agate, bold crystal quartz or green jade. I can't wait to see what strikes your fancy. The good news is that pieces such as these have endless styling possibilities. So, unlike the dress, once the wedding is past, your bridesmaids can wear their jewelry pieces for a lifetime and remember the fun and festivity of your wedding.